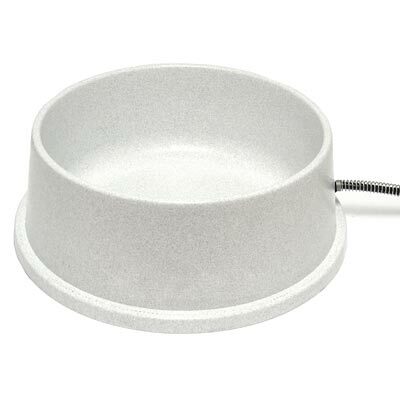 Keep fresh drinking water available for your pets in the K&H Granite Heated Pet Thermal Bowl. Placing this generous, all plastic bowl in your yard keeps 1.5 gallons of water available for your pets or wildlife, helping them stay hydrated all year. The hidden heating element uses only 25 Watts of power, warming the bowl and preventing water from freezing, even in sub-zero temperatures. Its significant capacity is wonderful for large dogs, and the granite color adds a natural hint to the item. A flared lip on the base keeps it stable on a level surface, and the all plastic body withstands the cold for many seasons. The 78" long cord easily powers the unit, and a steel spiral around it prevents animals from chewing on it. Ensure water is available to your animals all year with this Granite Heated Pet Thermal Bowl. One year limited warranty.